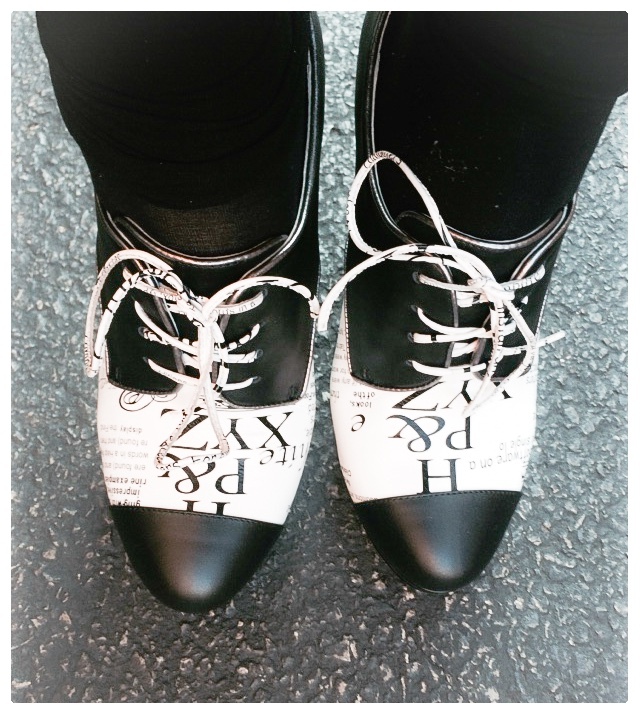 September | 2015 | Footwear Fashionista … a sneak peek into my shoe closet! The sudden drop in temperature means summer is over and fall has arrived. The sandals and flip flops are gone and it’s officially boot season. Feeling a little sporty, I pulled these out of the box today. 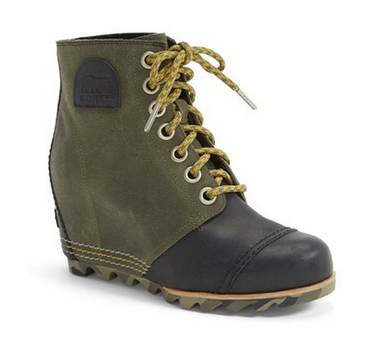 Sorel‘s iconic “1964 Premium boot” it’s been revamped with a modern edged, utilitarian style. Yep, they are really cool! Full-grain black leather and olive colored coated canvas. It was the color of the boot that stopped me in my tracks. 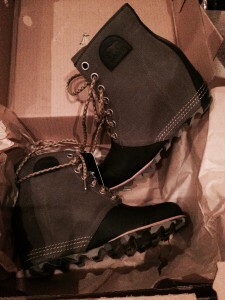 Like all Sorel’s they are water-resistant, which is a plus. The above ankle boot has a wedged chunky lug heel, camo-printed sole and extra-long tow-toned laces. You can size down in these, but since I like to wear thicker socks, I stayed true to size. Casual but cool…wrap your feet in style. Two weeks ago I met some friends out in Oakbrook for lunch. I arrived early and decided to check out Nordstrom’s shoe department (shocker, I know)! A wall of beautifully displayed shoes under the marquee “Shoes of Prey” called out to me, luring me in. It’s a design your own shoe company, Shoesofprey.com and Nordstrom in Oakbrook is the exclusive brick and mortar store that has the fabric samples and sample shoes to try on to determine your size along with helpful salespeople to assist you with the design process. Suddenly, I’m a kid in a candy store. This is heaven to a shoe addict! 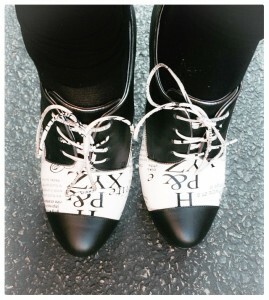 (Yes, I’m a shoeaholic. No, I don’t need help.) You design everything from the style of shoe, heel height, fabric for inside and outside of the shoes and any additional adornments you’d like. 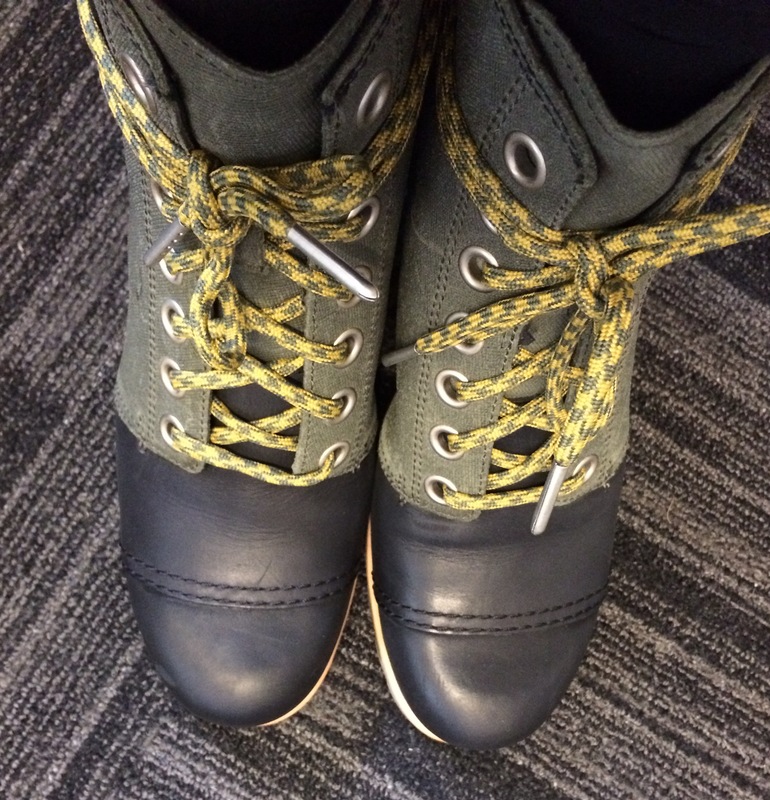 I did a quick design, met my friends for lunch and then returned to make some small modifications and purchase my shoes, leaving the store without a bag but an exciting purchase none-the-less. They claim that “crafting of your shoes will take 4 weeks, and delivery usually takes 2 – 4 days to metro areas (and maybe a smidge longer to rural locations).” They estimated my shoes would arrive by October 1st. My shoes arrived in less than two weeks! I received email updates as to the status of my shoes along the production line (confirmation of order, allocation station, where shoes are reviewed; stitch line, quality assessment and shipment). They arrived boxed with a letter from the person that worked to make my design a reality, along with a photo, love and care instructions, toe and heel inserts, heel caps and extra shoe laces. 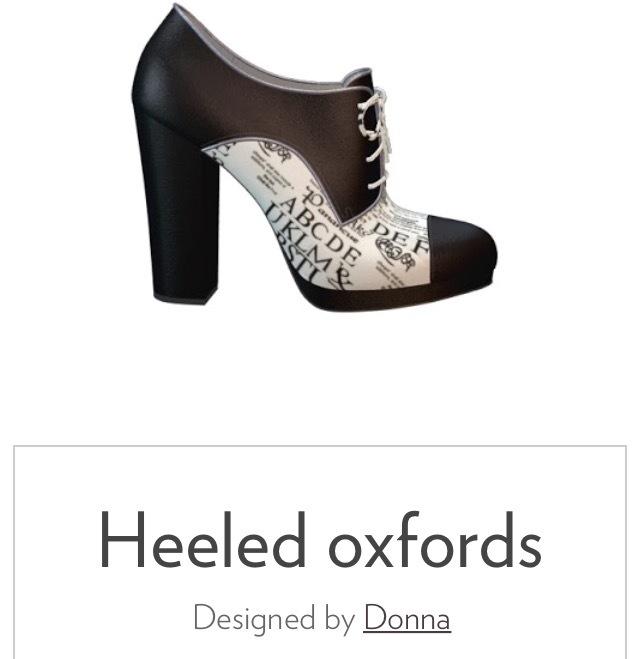 A high heeled custom designed oxford shoe, “designed by Donna”, has black leather 4.5″ chunky heel, upper and toe cap. 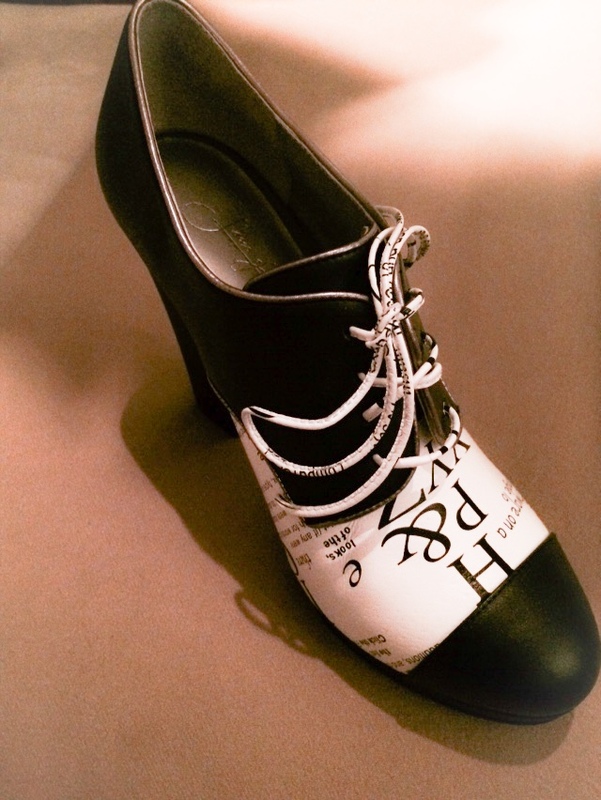 A white leather with black graphic type adorns the front panel and the laces. The piping is a shiny silver petwer blue. 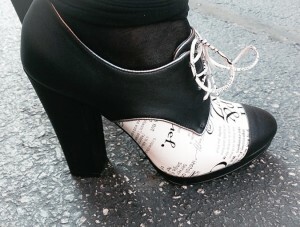 The shoes are extremely comfortable, stylish and truly one of a kind. Shoes of Prey also offers a 365 day return policy or they will remake your shoes if you aren’t happy. Talk about customer service! I’m so impressed with the quality of the shoe that I can’t wait to design my next custom pair. Because there really is no such thing as too many shoes!